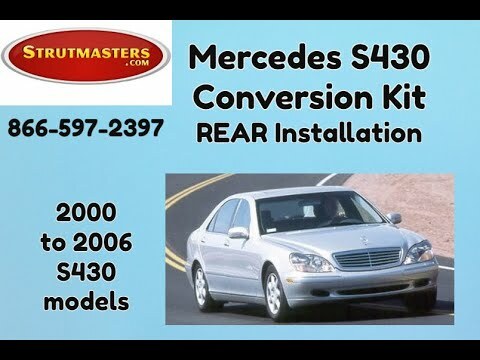 Strutmasters 2000-2006 Mercedes Benz S430 4 Wheel Active Suspension To Passive Coil Spring Conversion System is the perfect solution to your suspension problems. Designed to be very affordable, you can convert your ENTIRE factory suspension to use our exclusive custom tuned struts and coil springs for less than the price of replacing ONE factory strut at the dealer. 2000-2006 Mercedes S430 4 Wheel Air Or Hydraulic Suspension Conversion Kit With Light Fix is the perfect solution to your air suspension problems. Designed to be very affordable, you can convert your air suspension to use standard. We know all about the wide variety of parts that make up the faulty air suspension system on your 2000-2006 Mercedes S340. We work on these vehicles in our repair shop here at Strutmasters every day. We've learned the air suspension systems and active hydraulic suspensions on Mercedes vehicles depend on all the complicated components and electrical parts to work together perfectly. Just one malfunction, and the entire system goes down. Because diagnosing and repairing these systems are so expensive, Strutmasters has perfected a suspension conversion system that solves the problem permanently. This product includes a suspension warning light elimination module and four completely assembled coil over struts that go right in place of the factory components. Most of our customers will tell you they converted because of the low price, but they are surprised at how well the vehicle rides and performs. Take a look at the cost difference between choosing an active factory suspension versus a passive suspension system. 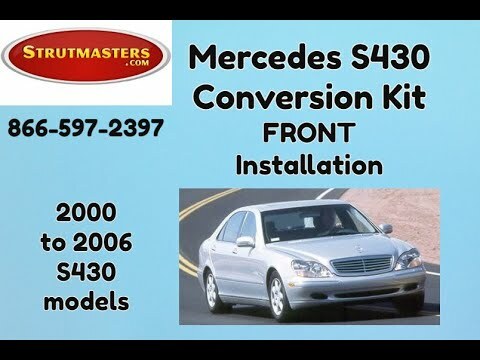 On this page, we compare three prices: that of a dealer repair or replacement of your S430 factory active suspension, that of installing aftermarket replacement suspension parts on your S430, and that of installing a brand new Strutmasters coil-over suspension conversion system. 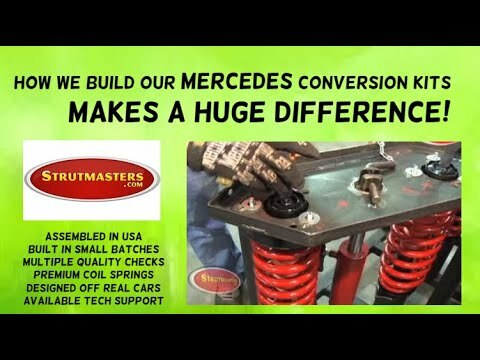 There's no surprise why thousands choose a suspension conversion system from Strutmasters. 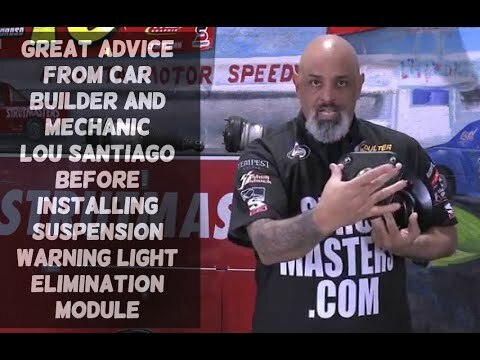 How Do I know If My S430 Air Suspension is failing? These vehicles were sold with EITHER the factory Air Suspension OR the Active Body Control (known as ABC system) Hydraulic Suspension system. The most noticeable sign of failure for either system would be a sudden loss of three to five inches of vehicle ride height. This could occur in the front, rear or either side of your 2000-2006 Mercedes S430. An illuminated suspension warning light in the instrument cluster is another indicator of trouble for either factory suspension system. An excessively loud onboard air compressor or hydraulic fluid pump may be present. You can do a visual inspection for fluid leaks in the struts, lines and connection points of the active hydraulic system. Although cracks in the rubber air springs are the most common cause of leaks in the air suspension models, they may not be noticeable until the air springs are actually removed from the vehicle. + Air/Hydraulic Strut Assemblies ($1,070/strut) ) + Air Compressor Assembly ($450) Or + Hydraulic Pump ($1,510) = Over $5,700 (and that doesn't even include replacing electronic components that are known to fail such as the height sensors). + Strut Assemblies ($590/strut) + Air Compressor Assembly ($400) Or + Hydraulic Pump ($1,080) = Over $3,500 (and that still doesn‚Äôt include replacing electronic components that are known to fail such as the height sensors). 2000-2006 Mercedes S430 Air Struts (x4)- (models with air suspension only). Commonly referred to as air bags, a plastic and rubber spring uses pressurized air as a cushion (in place of a metal coil spring) to support the weight of the vehicle. On vehicles with the air suspension systems, an air spring is mounting atop a traditional passive strut filled with a gas-charged hydraulic fluid at each corner of the vehicle. The entire unit is commonly known as an air strut. The rubber portion of the air springs are the number one cause of all air suspension leaks. Since all air springs go bad at about the same rate, if one is leaking, the others will not be far behind. For a proper repair, all of them need to be replaced at the same time. 2000-2006 Mercedes S430 Active Hydraulic Strut (x4)- (models with hydraulic active suspension). Vehicles with the Active Body Control (ABC) active hydraulic suspension will have one of these on each wheel. These struts are more expensive and more complicated than a traditional passive strut because they have mechanisms which change the dampening rate (valving) inside of the strut hundreds of a times a minute. Hydraulic fluid is delivered to each strut at a much higher rate of pressure than a traditional strut. The dampening rates are controlled by a suspension control module. 2000-2006 Mercedes S430 Height Sensors (x4)- a linkage located near each wheel of the vehicle that constantly measures the height of the vehicle and reports this information back to the control module so that the computer can identify if changes in height need to be adjusted accordingly. The ride height sensor is a moving part, and like all moving parts, they will eventually wear out. 2000-2006 Mercedes S430 Air/Hydraulic Lines- tubes that run from a compressor to the air struts (or a hydraulic pump to the hydraulic struts for models with hydraulic active suspension), which deliver air to the air springs or hydraulic fluid to the active struts in order to adjust the height of the vehicle. 2000-2006 Mercedes S430 Solenoids (x4)- These plastic and metal components regulate the air pressure for each air spring. Solenoids start to leak as they wear out and may cause the vehicle to sag or to lean. This will cause the ride height sensor to send a signal to activate the compressor in an attempt to inflate the air suspension and level out the vehicle. This excessive work load will eventually lead to total failure of the compressor. 2000-2006 Mercedes S430 Compressor Assembly- (models with air suspension only). Creates and sends pressurized air to the air springs. When the air suspension starts leaking, the compressor (also known as an air pump) starts working harder to try to keep the system inflated. By the time air suspension leaks down completely, the compressor will either have failed or be well on its way to full failure. 2000-2006 Mercedes S430 Hydraulic Pump- if your Mercedes has hydraulic suspension instead of air suspension, then the hydraulic steering pump will also serve as the reservoir for the hydraulic fluid going into the struts. 2000-2006 Mercedes S430 Suspension Control Module- a computer which is responsible for the operations of the air suspension system (or ABC active hydraulic system) and maintaining the vehicle's correct ride height. 2000-2006 Mercedes S430 Rubber O-rings- Although they are the least expensive parts of the active suspension systems, they are responsible for maintaining the seal where all of the air lines or hydraulic lines connect. Be sure to replace the rubber O-rings when repairing any active suspension system. Great work Jason. Everything was very clear and on time. We have not put the parts yet in our car but your service was great. 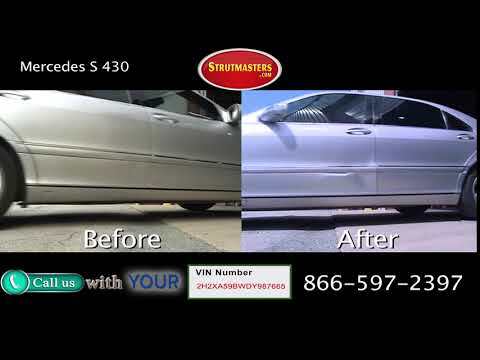 Strutmasters has created a great product replacement for Air strut replacement! The Strutmaster struts provides a smooth ride and comfort that Mercedes has become synonymous with. The Strutmasters ride is almost identical to the OEM struts. I would recommend this product to anyone needing to replace air struts, with this type of conversion you won’t lose! It’s well worth the price. I had the best customer interaction with Donielle. She was very attentive to my needs and made sure that I had everything I needed to help me with the conversion. Her customer relation skills exceeded all of my expectations. She was a pure pleasure in assisting me with all of my needs!. Thank you! Don’t normally post reviews but wanted to share my experience with Strutmasters. My s500 suspension failed and was quoted thousands to replace with original parts. Found Strutmasters through an online search and saw that they were close by. I scheduled an appointment for them to look at my car at their facility. What an UNBELIEVABLE facility and an awesome group of people. They not only had the parts in Stock but installed the parts on site all for less than 1/3 of the original quote. My car sits and rides awesome!!! If you are on the fence, don’t hesitate you will not regret it!!! 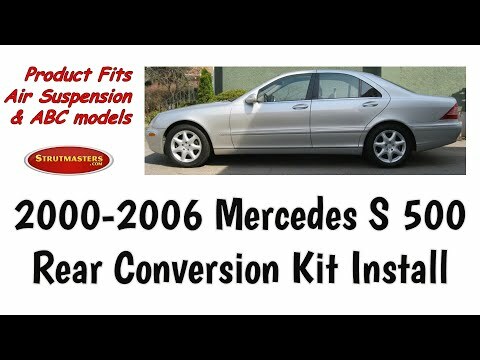 My 2001 s500 Mercedes Benz hydraulic suspension failed. So instead of having it replaced with oem struts. I called Jason @ strutmasters and purchased the coilover conversion kit. I paid my mechanic 500 usd to install it. Contrary to peoples opinion about Strumasters and negative review of the product on the Mercedes Benz forum, the s500 ride is super smooth and performed like a new car. I drove the vehicle at different speeds from normal city driving with lots of stop and go and freeway driving @speed 75 up to 140mph when it’s safe to do so for 2 weeks and my conclusion is that the Strutmasters coilover kit is superbly manufactured and performed very well. I rate it from 1 to 10, believe it a happy 10. Thank you Strutmasters for a great product. And saving me money. God bless the USA and God bless all of you @ Strutmasters! Jennifer was so kind to help me get to the conversion kit. The transaction was very easy over the phone. Thank you Jennifer – it was a great deal! My Benz was slammed to the ground. It is no more. The front is actually sky high which I can’t stand but @ least she ain’t scrapin asphalt.. Wish I could’ve had them installed @ Strutmasters facility in Roxboro NC but that wasn’t an option due to them building new facility. 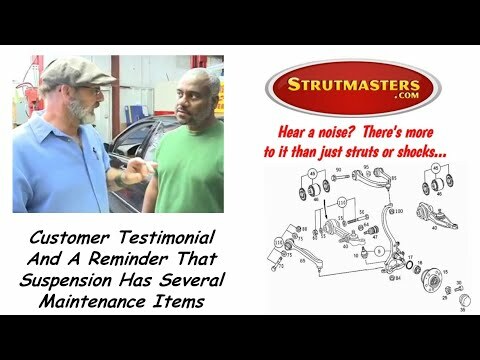 When I called Strutmasters, I encountered a very informative gentlemen named: (Darrell Chandler), that informed me on my issues and gave me knowledge of various options to satisfy my mechanical needs. This experience was over and above customer service, I felt more like a friend then a customer. My needs were met and the issue solved. Darrell Chandler provided excellent service. Great job Strutmasters Team! Very knowledgeable & professional. I had this problem with my 03 S430 for 3 yrs. now. Thanks to Strutmasters the problem no longer exists & I saved a lot of money & the ride is great. Being from Greensboro & Strutmasters being in Roxboro NC 70 miles away, I set up a appointment and drove my S430 to Roxboro, slowly! Nice meet and greet with Darrell, Matt, Randy & JP, all very nice people. I was invited to tour around the office & the Auto Museum. Lots of History, Autos, Sports & Stuff. Thanks Strutmasters, I am so happy to be rid of the suspension problem. Please let everyone know you are located in Roxboro, NC.